And then there was one. Cyndie came inside from feeding the horses yesterday around dinner time and reported that the Buff Orpington was the only chicken under the barn overhang. The chickens are usually eager for her afternoon chores because they get a fresh serving of treats to eat. It was uncharacteristic for the two Barred Plymouth Rock hens to not show up. In addition, it was snowing like crazy, so it seemed odd that they would be off gallivanting around the property without the Buff. That pointed to nothing good. I put on my winter gear and joined Cyndie and Delilah in a scouting mission around the grounds. 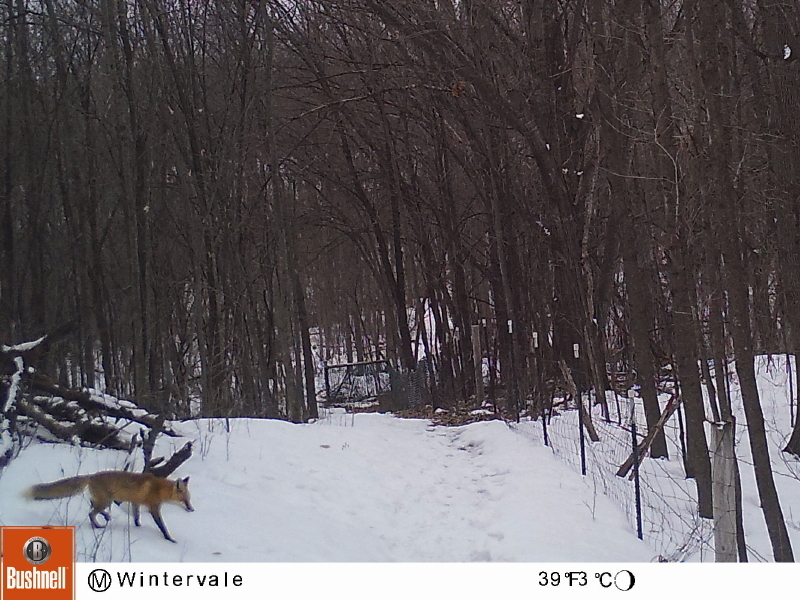 We circled past the trail cam, and I grabbed the memory card from it. Cyndie had picked up three eggs from the coop in the afternoon, but our search didn’t come across any tracks revealing recent activity in the vicinity. We headed inside with a sinking feeling of more loss. For all the multitude of empty scenes that regularly show up on the trail cam, this time we landed one positive ID out of the nine images on the card. That little fox walking toward the fence was ten minutes ahead of Cyndie and Delilah walking down that trail on their noon trek. They never saw it, but I bet Delilah smelled the scent. We took a tiny bit of solace in the fact there was no chicken in the fox’s mouth in the image. At dusk, with a looming trepidation, Cyndie went down to close the coop. The Buff was in there all by herself. With Delilah, Cyndie walked one more loop around the back pasture for any sign of what may have happened. It was Delilah who took noticeable interest in a dark spot inside the fence. Cyndie tied Delilah outside and climbed through the wires and found the proof of our worst fear. Now we are wondering if we will be able to accelerate the introduction of our new chicks to the lone surviving chicken from last year’s flock. The poor girl must have been cold and lonely all alone last night in the coop.